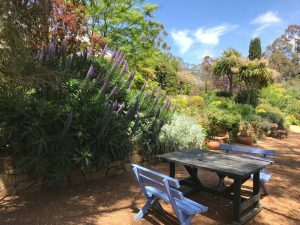 An established Mediterranean style garden and olive grove. 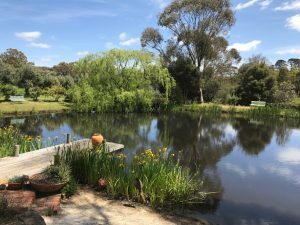 Limewashed mud-brick house & studio overlooking distant hills, garden terraces and dam fringed with yellow water iris, willow, birch and paper barks. Old entwined wisteria and Cherokee rose. Mixture of cordylines, pencil pines, exotic and native trees; clipped, rounded forms and soft flowing plantings. Beautiful dry-stone walls.